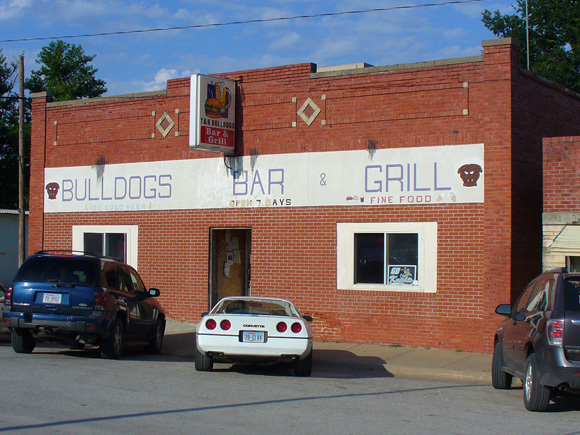 Scooter’s 571st bar, first visited in 2009. We made our way over to Murdock and parked across the street from the bar, conveniently right in front of the post office. 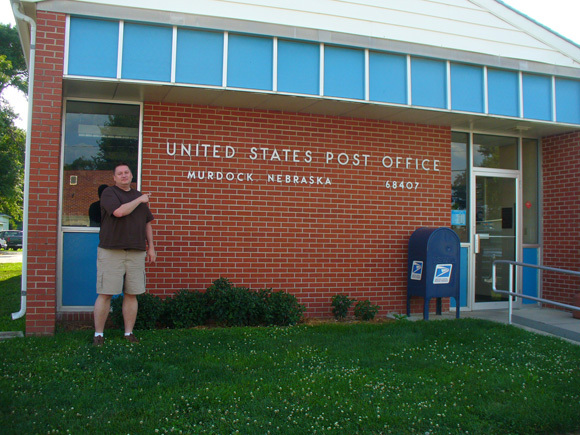 Unfortunately I still did not have any stamps and this was the town I wanted to mail my cards from. As we stepped in the door we were bum-rushed by two little kids who darted in past us and took the only two remaining seats at the bar. Most of the tables were occupied. As we looked around for a place to sit, three guys at the other end of the bar scooted around to make room and invited us down to sit near them. Our bartender’s name was Lori and she was very busy dealing with a full house, but I was finally able to get a moment of her time to find out if she or the bar had a couple of stamps I could buy. Unfortunately, she did not. Just as it looked like my hope of mailing out these cards with my last name as the postcard was dashed, one of the local guys who had moved earlier to make room for us chimed in. “”I think I have some stamps in my car,”" he said, “”I’ll be right back.”"
A few moments later he returned. I gave him a buck for the stamps and bought him a beer for going above and beyond the call of duty. Had those two little kids not chumped us for the barstools, I’m most likely have had to mail my cards from Lincoln instead and lose the fun of the Murdock postmark.